The weather starts to cool a bit and you can't wait to start hiking with your dog again. But watch out for snakes. Snakes are most active in the spring, early summer and fall. 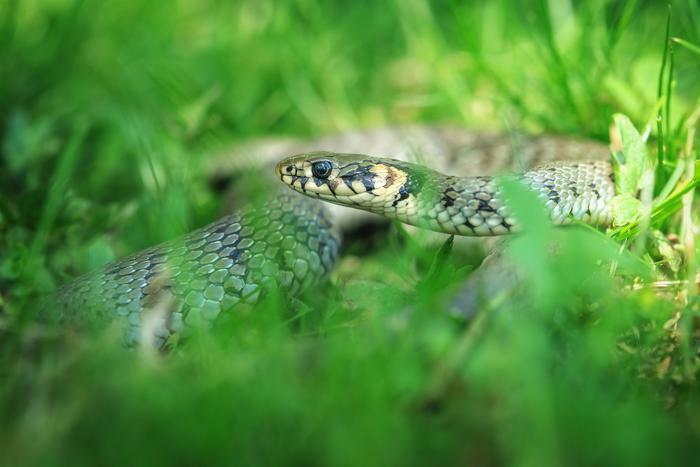 Most snakebites occur between April and October, when weather is warm and outdoor activities are popular. So you want to be careful about keeping your pets -- and yourself -- safe. Thankfully if your dog happens to get bitten by a venomous snake the odds are that it will recover. It depends on a number of factors as to how lethal that snake bite actually is, including: the age and species of the snake, how far the fangs went in, how much venom actually went in as well as the location of the bite and the size of your dog. Fall is also breeding and hatching season, with males aggressively vying for females’ attention and newly hatched babies on high alert for predators. Snakes can't see far away -- they are nearsighted so they are more prone to lash out. Watch out for piles of brush and stacked logs. Make sure you don't keep such things near your house. Copperhead snakes look for their prey in the middle of these brush, logs and other hiding spots. Watch where you step. You might think blacktop is the least likely place to find a snake but the warm blacktop is like a mini massage for them. Also, watch for snakes when it's raining. Snakes love the moisture especially after a downpour. Don't try to shoo a snake or brush it off your path. It sees that as a threat and it is more likely to strike. Just walk way around it and let it move along at its own pace. Copperheads also molt several times a year shedding their entire skin, even their eyelids, so they become blind which again makes them feel threatened. If you are out walking keep your dog on a leash. Keep your dog away from holes in the ground. Try not to walk to much at night -- rattlers are nocturnal. If your dog seems unusually curious about "something" hidden in the grass, back off immediately until you know what that something is. Try to identify the snake by taking note of its size, color patterns and the presence or absence of a rattle at the end of the tail. Look the dog over carefully for fang marks, noting that there may be more than one bite wound. If bitten on a leg, wrap a constricting band on the affected limb snugly at a level just above the bite wound (on the body side of the wound). This band could be fashioned of a shirtsleeve or other fabric and should be snug but not excessively tight. The compression around the limb will slow the spread of the venom. The dog may lose the limb but that is better than losing his life. Start your journey to the nearest animal hospital while trying to keep the dog as quiet as possible.